AZ Locksmith provides ultimate motorcycle locksmith support for all your needs. All you need to do is inform us about your make and model and we will give you a flat price instantly. An ignition repair, key duplication or lockout of your motorbike is always a difficult situation especially if it occurs at an unexpected time. These circumstances could happen if you have broken your key in the ignition and need a new key or if you have misplaced it. 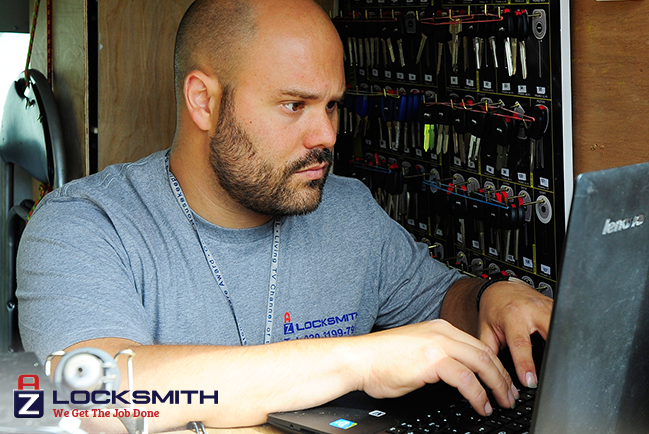 To ensure a fast and easy solution for your problem, it is always advisable to call a verified and licensed locksmith. In case the key has been lost, we can replace the key according to its original specifications by picking the ignition or gas lock. Then we will retrieve the correct key code, cut it for you on the spot and program it, so you can start the bike. AZ Locksmith can duplicate your motorcycle key so you can have a spare key in case the original key is lost or locked inside the motorcycle storage or in another location. In case of damage to the ignition or a stolen key, we can repair or replace the ignition. So that the ignition will be usable and the original key will not be able to be used on the motorcycle ignition. We can open the storage lock as well as the gas tank lock on most motorcycles. We can extract a key from the ignition, gas tank lock, and storage unit lock and if there is damage, we can also replace those locks. If any of the keys to the locks on the motorcycle are lost or stolen, we can change the internal wafers in the lock to create a new key for the lock (rekey) or change the locks, in both cases, the former key will no longer be able to be used on these locks. Don't wait for a small problem to get worse, call our motorbike locksmiths to get personalised and professional support. Our locksmiths are fully trained and experienced to make sure each job is completed properly and we guarantee our work with a 1-year warranty. Our services are 24/7/365. Give us a call and we will be there as fast as possible!